The Hotel Invoice Template is used to charge guests for their stays at hotels, motels, and hostels. It can be used to charge for several rooms at differing costs per night. This is useful for families, parties, teams, and other groups who need to rent out multiple rooms. 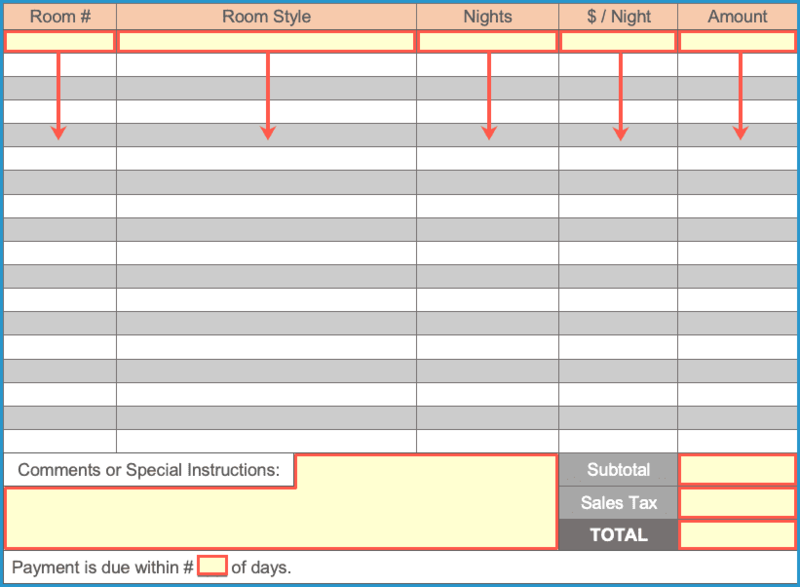 The Invoice Template includes areas for both the Hotel and paying guest’s contact information. All four formats are easily editable, ensuring the templates can be designed to match any hotel’s unique color or content requirements. Before heading to the first step, download the Hotel Invoice in either Adobe PDF or Microsoft Word. In the “Bill To” table, enter the Invoice Number, Invoice Issue Date, Guest Phone Number, Full Name, and Full Address (Street, City, State, and ZIP Code). In the table, start by entering the Room Number of each space rented. Then, enter the Room Style (1 bed, 2 bed, etc. ), the number of Nights in each room, the Cost Per Night ($ / Night) of each room, and the Amount per rented room (Nights X ($/Night)). Sum the Amount column to calculate the Subtotal, then add on any Sales Tax to calculate the TOTAL invoice amount. Write in any Comments for the guest, such as any notes regarding the stay or corrections to the listed amounts. At the very bottom, enter the number of Days the guest has to pay the invoice (leave blank or enter a zero for guests paying upon checkout).